Last week was a really “Grand” week that ended on a great note on Saturday, August 25. It was a time to celebrate the opening of the new Grand Bridge in midtown St. Louis and to reflect on the outstanding cooperative effort between the City of St. Louis, Metro, and St. Louis University that made this project a success. 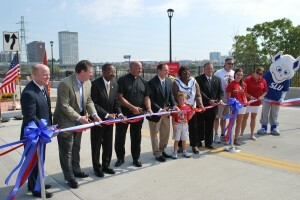 St. Louis Mayor Francis invited Metro’s President & CEO John Nations, St. Louis University President Lawrence Biondi, Grand Center President & CEO Vince Schoemehl who also serves on the Metro Board of Commissioners and others to join him for the official dedication of the new bridge and for the ribbon-cutting ceremony. The bridge was closed during the event, so after the ribbon-cutting attendees were able to explore the new bridge and to check out the new Metro transit areas. Earlier in the week, on Monday morning (August 20), Metro had resumed transit service to the Grand Bridge in midtown St. Louis. Customers told us they were happy to be back– thankful the 17-month long reroute of the #70 Grand, #58X Twin Oaks Express, and #410 Eureka Express was over. They were also happy the Grand MetroLink Station was open again. During the morning and evening rush hours Monday, Metro staffers and Metro Ambassadors welcomed passengers back to the Grand MetroLink Station and the Grand Bridge MetroBus stops with bottled water and bookmarks. The bookmarks contain information on how to stay in touch with Metro including this blog and our other Social Media outlets. Our customers also told us they really liked the new improvements at Grand. Metro spent about $7 million enhancing the bus areas on the bridge as well as the area beneath the bridge adjacent to the Grand MetroLink Station. New seating in large bus shelters, better lighting, large windscreens, new elevators, new stairs and designated MetroBus pullout lanes for safer boarding were constructed on the deck of the Grand Bridge. Beneath the bridge, two new areas were created by the Grand MetroLink Station— the Scott Avenue Transit Plaza and a 58-space free Park-Ride lot. The new plaza also features new seating options, greatly improved lighting, an illuminated sculpture, a bicycle rack, and improved fencing and landscaping. A lot of public transit customers will utilize this important transit hub because the #70 Grand MetroBus route is the busiest route on the Metro system with 12-thousand trips a day taken along the Grand corridor. That adds up to three million trips a year to work, school, entertainment venues, doctor’s appointments, stores and restaurants.